Before addressing the nuts and bolts of what Miss Mason taught for science and how we in the new millennium might teach science to our older students, it would be helpful to look at some of the general principles behind her educational goals. What did Miss Mason feel was the purpose of education in general, science in particular? What, in general, did she want the children to gain from their studies? What function was knowledge, of all topics, including science, to serve in their lives as students, and later, citizens? We would do well if we ask ourselves these questions as well for our own home-schools. If we know these things we will be better equipped to translate her methods into a program we can use today in our homes. Even though we may not all wish to incorporate her methods whole cloth, if we know the reasons behind her methods, we will be able to accurately assess both her methods and our own methods and goals and see how our own materials are helping us to meet our goals. We may discover that some of the very material we use is actually incompatible with our goals for education in general and for science in particular. To assist us in determining those principles, I offer some quotes on education and science (and the inevitable editorial commentary from your friendly writer) from Miss Mason herself. As is customary in my articles, I am quoting from volume 6 of the Home Education Series. One reason I use volume six is that it is in this volume that Miss Mason most addresses secondary education, which topic is of special interest to me as I have two teens and will have at least five more to educate through the teen years. The second reason is simply because it is my personal favorite of all six volumes. We can derive some of the principles which led to the goals and methods Miss Mason applied to science studies from the same general principles she espoused for all of education. Education was not, in Miss Mason's scheme of things to 'develop the faculties.' According to my dictionary, one definition of faculty is "one of the powers of the mind formerly held by psychologists to to form a basis for the explanation of all mental phenomenon." Ahead of her time, Miss Mason felt that the child's mind took care of its own faculties, if only given enough knowledge to enable healthy development. This means that we must have a broader goal in mind for science that developing the skills of critical thinking. Another thing Miss Mason felt was not the purpose of education was fitting a child with a means of earning a living. Miss Mason thought that the children should be educated for their own sakes, not for utilitarian purposes only (to work, to support themselves, to be dutiful citizens to their government and society), but to enable them to be fully alive and fully able to experience and understand all that it means to be human. Our goal should be to bring up our children to have "self-sustaining minds" to "awaken and direct mind hunger" so that every adult will continue to learn and to love to learn, to think carefully about each idea that he meets, to read and to read well. Therefore, Miss Mason would not be impressed by a method of selection that made its first question, "When will they need to know this?" Nor would she favor of method of selection that focused on careers, favoring computer studies over botany simply because the one would be more useful in a career than the other. Miss Mason believed that education should "make our boys and girls rich towards God, rich towards society and rich towards themselves." (Page 281) In the end, children educated in this fashion, would, Charlotte believed, be the best able to support themselves and function in a free society--but that was the by-product, not the goal. How does this work? What are ideas? This requires some thought, or at least it did for me, before really understanding the power behind the idea. To help understand the concept, Miss Mason explains that idea comes first, then the demand to confirm and illustrate the idea with facts and information. We may recognize that we are in the presence of Ideas rather than mere information because ideas are received with appetite and some stir of interest. We can have a relationship to this idea, a connection. We begin to notice that our reading matter, our conversations, our radio programs "bring food to the newly entertained notion' or give us matter for further thought on the topic. How many times have you read or heard something, been struck by that idea, and then noticed that much of what you read or hear over the next few weeks contributes to your thought on that idea? The more ideas we provide the children, the better able they will be to understand other, newer, ideas. Still sounds a little fuzzy? Miss Mason says that the idea we want our children to connect with may be concrete (a circle in the mind of a geometrician is one example she used) or abstract--those ideas that create what Miss Mason called an appetency toward something. The concept of a circle in the mind of a geometrician as an illustration of a vital idea really helped me refine my understanding of the concept, but not until I saw it in action in my own life. Permit me to digress with a little personal example. I am not a math wizard. I am not even a math literate. I took math in college because I had to, and I think I passed only because my tears melted my professors heart--or more probably made him want to be sure to get me out of his hair as soon as possible. He told me that in all his years of working with mathematics he had never seen so severe a case of math phobia, a dubious distinction of which I am perversely proud. Even those math tasks that I can do I don't really like, and I do as little of this sort of thing as possible. Nevertheless, for years I have been able to speak with a semblance of knowledge about circles and circumferences and diameters. I could tell you Pi was 3.14, and I know that there was some sort of connection with circles. I didn't really understand with any significant depth what I was talking about. I suppose I used those words as protective coloring to disguise my true ignorance. Nonetheless, in spite of my phobic and negative relationship with math, I suddenly felt the refreshing rush of real contact with all these bits of fact and information. I was struck by the ideas that connect all these dry facts and terms. How it all happened is as instructive as what happened. I was reading A Child's History of Geography aloud to my 9- and 10-year-old daughters. Perhaps because it was a geography book my usual defenses, which arise whenever I sniff a math discussion, didn't come up. The author was discussing the distance through the center of the earth and how we know what it is even though nobody ever has really been through the center of the earth. He explained, " It's a funny thing, but every ball, whether it is a little ball or a medium-sized ball or a great big ball, is always just a little more than three times as big round as it is through . . . I have often wondered why this was so--why a ball shouldn't be exactly three times or four times or five times as big round as through, but it isn't. You can try it yourself if you don't believe it. Take an apple or an orange and measure it around and then cut it and measure it through. It is twenty-five thousand miles round the World, because men have actually measured that. So we know that the distance through must be about eight thousand miles, as twenty-five is a little more than three times eight. This is not geography; it's arithmetic. If you want to use big words for "around" and " through," as they do in geographies, you must say "circumference" for "around" and "diameter" for 'through' . . . "
Suddenly I realized, really realized, with my mind and not just my superficial memory, what Pi and circumference and diameter meant! Suddenly I was interested in and had a relationship with circles--all circles, big and small. I looked at circles, oranges, golf balls, bowling balls, the little rubber ball the girls use to play jacks and the big rubber ball my special needs child used to use for physical therapy, all in a new, and interested light. "Hello," I could comfortably think to myself, "I know you, you're a circle, and your diameter times pi will give me your circumference," and it was a pleasure to know this--to really know this. It was akin to the pleasure of meeting a familiar and friendly acquaintance on the street--perhaps we only exchange nods, but it's a pleasant, experience, uplifting in its small way. It is a relationship with an idea. It is a pleasure to know. This is what we want for our children in their education. How it is best accomplished will be the subject of a later article in this series, but the way it worked in my example is instructive--it was through a literary medium. However, I race ahead of myself. This is all too easy to do when working with such exciting ideas as those of Charlotte Mason's. It is delightful to know, and it is delightful to see our children delight in the subjects put before them as they develop relationships of their own. Miss Mason also thought it was important not to confuse mental gymnastics with education. She likened mind to an organism, like the body, that needs food in order to grow. Exercise is also good for both mind and body, but neither mind or body will grow on a regimen of exercise with no food. The proper food for mind, as we have discussed, is ideas, knowledge. Now it seems to me that logic problems, word problems in math, exercises in comparison and contrast, listing the tables of the elements--these are all mental gymnastics. They have their place in education, but that place is limited, and meaningless without a healthy diet of wide and varied knowledge. If we keep in mind the difference between mental gymnastics and mind food, we will not substitute the one for the other in our science programs. These are general principles. We should consider them as we choose material and determine the direction we wish to go with every subject. I have tried to include some application of these principles to science in particular. Doubtless, many readers may think of other and better applications. As usual, I ask that if at all possible, people read Miss Mason for themselves. Volume 6 alone is nearly 350 pages long. It is hardly possible that the above few paragraphs are an adequate distillation of so much information. When you consider that there are five other volumes to peruse, it is even more obvious that I can barely have touched the surface. Furthermore, when I read homeschooling books, it is with my own family dynamics specifically in mind. As someone else has pointed out, we are all really more alike than we like to think, but there are some differences, and I may be missing the very piece of information that would make it all fall into place for you. So please, read Miss Mason at first hand if at all possible. Science is to afford wonder to the mind (from pages 40 and 41). "Where science does not teach a child to wonder and admire it has perhaps no educative value." (Page 224). Science is to "explain to some extent the phenomena we are familiar with and give a naming acquaintance at any rate with birds and flowers, stars and stones. . . " (page 254) Science should show that they live in a world ordered by natural law. So science should increase and feed our wonder and delight in the world around us. It should spark our admiration, both at the wonder of creation and the skill and wisdom of the Creator. It should put us on speaking terms, so to speak, with the natural world, which means we must know the names of the inhabitants and their surroundings (the features mentioned above), and it should introduce us to the laws that order our universe as well as the methods used to make scientific discoveries. That's a pretty tall order. It wasn't very easy in CM's day, either. She complains that science as taught causes history to expire, poetry to die unborn, and religion to faint. Charlotte also says, "we are filled with compassion when we detect the lifeless hand or leg many a man has brought home as a consequence of the War. But many of our young men and women go about more seriously maimed than these. They are devoid of intellectual interests, history and poetry are without charm for them, the scientific work of the day is only slightly interesting, their 'job' and the social amenities they can secure are all that their life has for them." She calls this a 'maimed existence.' How many times do we hear of women leaving their babies in daycare so they can back to work, not to put bread on the table, but so they can get some "intellectual stimulation?" "Entertain me" is the cry of our day. So many people must be spoon fed their intellectual food--left to their own devices they are as helpless at securing intellectual sustenance as newborn babe is at securing food, perhaps even less capable. A well rounded, solid, healthy educational background should go a long way toward preventing a 'maimed' existence for our children. If we do well with science, they will be more than slightly interested "in the scientific work of" their own day, and will have many intellectual interests. Miss Mason thought science, along with all the other elements in her programmes, should provide students with lifelong interests and intellectual pursuits. But more important things are yet to come. "Where science does not teach a child to wonder and admire it has perhaps no educative value." (Page 224). Our goals do, to some degree, affect our methods. Consider these two views of science. Compare Miss Mason's goal of 'wonder to the mind" with the goal of scoring well on standardized tests. Which is more likely to introduce science in such a way that the child wishes to pursue the acquaintance? Which is most likely to end in a child who loves the subject and meets with others in the same field with delight? One is a stone, and one is bread. Which will we offer our children? So the key is, as in most topics, good books that make science come alive--give us a sense of wonder, of the beauty of the natural world. This is still true for high school students, in fact, vitally true. As the authors of the book Science Matters (Hazen and Trefil) put it, there is a difference between doing science and knowing science. Most of our students are not going to be doing science, and those that are, will learn what the need to know in college. All of our students will need to know science in order to make sense of newspaper articles, new discoveries, mistakes in the kitchen, and their own children's schoolwork, and most of all, to continue life with vital interests in the world around them. 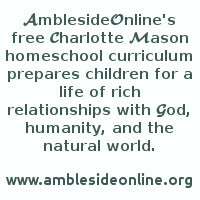 Charlotte Mason's 'wide and generous curriculum' ideas were ahead of her time, and perhaps ahead of ours. Trefil and Hazen point out that Ph.D's in one field of science have a shocking lack of the rudimentaries of other fields of science. Those of us who use Miss Mason's ideas will be giving our children a better education for life than many PhD's have! Now that we have some understanding (and perhaps dismay) at what we seek from the study of science, we need to know how to extract all that is good and wonderful from a subject many think of as dry and boring. How shall we transmit the joy and wonder underlying the principles of science to the children? Part III - But How Do We Do That? I have already shared a portion of Miss Mason's vision about the purpose of education in general. She believed education was to serve the children themselves, not to develop and promote their strictly utilitarian value to society. Education, Charlotte taught, should enable them to have a relationship with various aspects of the wide world around them. We've taken a more specific look at Miss Mason's views on the purpose of science in education. We learned that she believed the main purpose of science "is to afford wonder to the mind," and that where "science does not teach a child to wonder and admire, it has perhaps, no educative value." Science also should "explain to some extent the phenomena we are familiar with and give a naming acquaintance . . . with birds, flowers, stars, and stones . . . " and science should demonstrate to the children that they live in a world ordered by natural law. And now we all want to know how to do this. As I mentioned before, Miss Mason complained that in her day, "science as taught causes history to expire, poetry to die unborn, and religion to faint." Charlotte is excellent on philosophy, but at times short of practical how-to's. Does she give us what we need to know how to extract all that is good and wonderful from a subject many think of as dry and boring? Miss Mason says that when, "in the 18th century, science was alive, quick with emotion," it "found expression in literature." (Page 318) Science and literature together? That would sum up a significant portion of Miss Mason's approach to science. So the key is, as in most subjects of a CM education, good books that make science come alive--give us that vital sense of wonder--the 'wow' factor. And what Charlotte Mason meant by good books is good stories. She believed that Science is best presented not through facts, figures (charts and diagrams) and demonstrations (experiments that serve as little more than stunts), but through stories! Human beings are not computers. We forget bits of information, strings of facts, and dry data. But tell us a story, and we remember much more. This understanding of the importance of stories in human understanding is so profound, so far in advance of her contemporaries, so remarkable, that words fail me. Let us instead consider the words of Dr. Renee Fuller, a current pioneer in cognitive research, "Bits of information cannot function as thinking units, that is unless we make story-engrams with them. Fundamental to human thinking is that we are story bound. Organizing the stimuli that surround us in story form is how we structure our world; how we make sense out of our environment; how we describe cause and effect relationships, and every other relationship." Stories! We can reach across the dry data, facts, and diagrams and light our children's imaginations with well-told stories. Even not so well told stories will have a better chance of transmitting scientific principles and knowledge than bare facts, devoid of all human interest or story-telling. This is true even in high school. Many of the most recent scientific discoveries are stories of glorious deeds, grand detective stories, and exciting adventures in the lab if only we could find the right person to tell the story. Scientists are people as well, and every person is part of some sort of story. Interest our students in the people behind the science and they learn, and remember, the scientific principles involved as well. Scientific truths, quotes Charlotte, are battles won. Describe the principal and most heroic of those battles and you'll interest students in the results of science, light their enthusiasm for the conquest of truth--all through giving them ideas clothed in history and story. Clearly, well told biographies of scientists are an important way to utilize stories in your science courses. Charlotte thought it important that the children be able to "experience what they read in the mind's eye." The writing of their books, she said, should be graphic and terse, because the student must be able to visualize the scene in order to narrate it and retain it. (Page 30). Children in Miss Mason's schools learned science principles rather than technical details. In fact, she said, "details of application are likely to be so technical and minute that they serve best as general illustration of the principal rather than the main subject of the school work." She recommended Holden's The Sciences because of his ability to write well and link universal principles with common incidents of every day life. She also used Ruskin's Ethics of the Dust for geology with older students. Both books are, of course, out of print, difficult to find, and perhaps also out of date. However, if you can find excerpts from these somewhere, you may find them useful in discovering how Miss Mason herself applied her own principles to the practice of educating students. Two books we have found that we think are in line with Miss Mason's goals are: The Boy Scientist, by Popular Mechanics, and Famous Science Experiments and How You Can Repeat Them, by Brent Filson. Both books approach the subjects with brief but interesting biographies of the scientists, an interesting and sometimes exciting story of how that scientist came to make the scientific discovery, what it meant for mankind, followed by an experiment or two demonstrating or imitating in some way the scientist. Both are also, sadly, out of print. Both are also more appropriate for younger students, Jr. High or earlier. For high school chemistry, we like Isaac Asimov's Building Blocks of the Universe, like all the best books, also out of print. These are just a few suggestions, and I have by no means exhausted Miss Mason's information on science. I hope I have only whet your appetites for more of her own words, and urge you to read what she has to say for yourselves, in context with the whole of her philosophy. It should prove a richly rewarding study.